Raring to take a breather from the mental stress of non-stop phone notifications, emails, and social media alerts? Given the hectic pace of today’s world, it’s not surprising that more people are going for travels that take them into the wilderness. Rainforests, mountains, grassy plains, secluded islands. These are becoming premier destinations, and the hotel industry has been evolving alongside this wanderlust for nature; stepping up to create luxurious alternatives to your typical tent and cabin. Waterfalls naturally elicit awe, but the Iguazu Falls in Peru take this to a whole new level, even being described by many as the most impressive waterfall in the world because of its immense water volume. 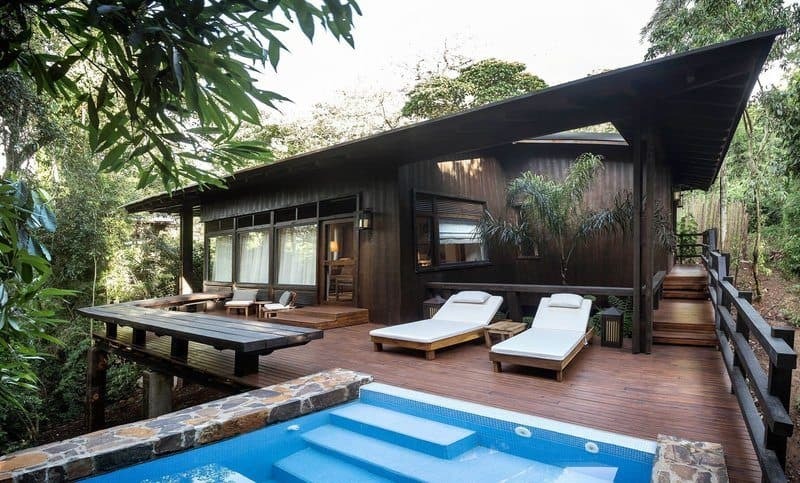 To enjoy this natural wonder set amidst the Atlantic Rainforest, book a stay for several nights at Awasi Iguazu, which offers 14 spacious villas at different locations all around the jungle. Comfort is a guarantee, since each villa comes with a pool, an outside deck for viewing, and even a private guide and a 4WD for getting around. But despite the glam, Awasi Igazu embodies its surroundings—villas are built on stilts and decorated with traditional materials from the region, and the main restaurant specializes in gourmet meals made in the style of local cuisine. The Maasai Mara is one of Kenya’s most iconic attractions. Those waiting to glimpse the sunset or even the famous wildebeest migration can bide their time at Angama Mara, a luxury safari lodge that’s personally managed by owners Steve and Nicky Fitzgerald. The name literally means “suspended in midair” in Swahili—appropriate, given that the lodge is the only one in the area that stands as high as around 1,000 feet above the Mara. Its 30 tented suites are divided into two camps, and each suite is spacious and quiet, complete with viewing decks and floor-to-ceiling glass fronts that ensure the Mara is always visible. Angama Mara also has common guest areas. Kenyan safari food made with local ingredients is easily accessible, and you can choose from a wide variety of tailor-made safari experiences, including hot air balloon and walking safaris. Kangaroo Island has earned the moniker of Australia’s Galapagos because of its wildlife diversity, which includes sea lions, seals, kangaroos, and more unusual animals such as bandicoots and sea eagles. Perched dramatically on a clifftop, the Southern Ocean Lodge overlooks the Island, allowing guests to take in the rocky landscape as well as the expansive Southern Ocean coast. Serenity amidst nature is a defining characteristic of this lodge: aside from the remoteness of the island, all 21 of the suites are equipped with a terrace and floor-to-ceiling windows, and the lodge draws partly on environmentally friendly solar power. One can further arrange tours with naturalists, enjoy the restaurant and wine cellar, or unwind at a spa with Aboriginal-inspired treatments. Located in Kirkenes, a small Norwegian town that’s excellent for observing the Northern Lights, this hotel is starkly different from the rest on this list because it’s made of ice and snow—a literal igloo hotel. If that sounds like the stuff of stories, here’s the quick physics behind it: snow itself is cold, but it makes for a great insulator, preserving the temperature inside so that rooms remain warm and cozy. To add to the magic, each room is organized around a unique theme, with sparkling ice sculptures and snow art based on Norwegian and Sami culture. Alternatively, you can stay at a Gamme cabin that resembles a traditional fishing and hunting hut. Beyond the hotel’s amenities—a huge ice bar, sauna, lounges, and local-style restaurants—guests can get busy with seasonal activities, from cross-country skiing to summer rafting tours. Thailand’s Phuket Island is a delight to visit because of its hodgepodge of beaches, charming towns, and lush greenery. Among the best hotels on the island, Keemala combines unconventional architecture with a dreamy, serene ambience to form an intimate tropical paradise. Guests can look forward to four types of accommodations that are creatively based on the dwellings of ancient Phuket tribes: Tree Pool Houses, Bird’s Nest Villas, Tent Pool Villas, and Clay Pool Cottages. Holistic wellness is at the core of Keemala’s philosophy, and this shows through extensive treatment pods and options for yoga, meditation, and physical exercises. In addition, it promotes sustainability by using eco-friendly building materials, organic products, and locally sourced food. The Teton Mountain Range brings the old American West to life. Set against the wide sweep of Jackson Hole Valley; it makes for a stunning sight, and adventure abounds in the form of outdoor activities, wildlife viewing, and national park explorations. Amangani (literally “peaceful home”) is a three-storey hotel that’s perched on a hillside. Lying 7000 feet above the ground, it takes full advantage of the landscape, matching the rustic setting with carefully curated interiors. Gigantic windows, cozy furniture, and fur fabrics are common elements in their suites, all of which are equipped with balconies. The spa incorporates a sandstone terrace, and the main restaurant, called The Grill; specializing in American-Western cuisine, all in all providing a satisfying hideaway after basking in the great outdoors. Imagine taking a helicopter ride to get to your hotel: that’s the definition of ultra-luxury. Sonora Resort is part of Relais & Chatelaux, a collection of gourmet hotels and restaurants. However, instead of being amidst city lights, it’s right at home in the wilderness of Sonora Island; an idyllic location that boasts of lakes, pine trees, and bald eagles. The resort’s features are top-notch. Boredom is impossible when you have access to a game room, tennis and basketball courts, a water-based spa, a mini-cinema, and rooms emphasizing the spectacular view with floor-to-ceiling windows. The restaurant is another highlight because of its inventive dishes and five- and seven-course menus. Conveniently, Sonora makes it easy to reserve activities such as kayaking, fishing, and adventure tours.